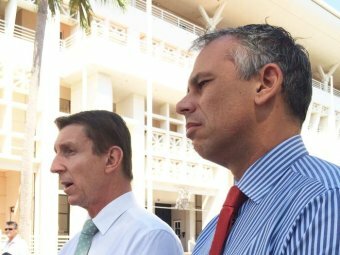 Adam Giles has been dumped as the Northern Territory's chief minister after a late-night leadership spill. Primary Industries Minister and Member for Katherine Willem Westra van Holthe, 52, held a press conference at 1:00am to announce he had seized control. The successful coup came after a phone hook-up late on Monday, the same day several of Mr Giles's colleagues pledged their support for him as leader. The ABC understands the vote was split nine votes to five. The coup came after reports on Monday that Mr Giles narrowly avoided a leadership challenge last week amid ongoing concerns about his leadership style. Attorney-General John Elferink is the new deputy, replacing Peter Chandler. In his hastily-arranged press conference, former policeman Mr Westra van Holte said "tonight was no particularly special night" when asked what had triggered the overturning of Mr Giles's rule. He said there had been "discontent with the direction of government" which had "been around some time". As a government, I acknowledge we could have done things better in the past. Speaking from a prepared statement Mr Westra van Holte said the Government "could have done things better in the past". 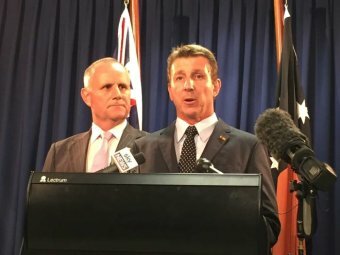 "Under my leadership, this government will be more consultative with Territorians and engage with them before we make important and crucial decisions to the future of the Territory," he said. Mr Westra van Holte said his Government wanted to provide "stability and confidence for all Territorians, especially our public service". "We acknowledge that we must work more closely with the community as we move forward and make the Territory a better place to live," he said. Mr Westra van Holte thanked Mr Giles "for his time as chief minister". When asked if he would explain why the party had dumped Mr Giles, he said more information would be released on Tuesday. Pressed on the matter, Mr Westra van Holte said he would be "far more consultative with the people of the NT... I'll have faith in the ministers with whom I am working". Mr Westra van Holte described himself as an "honest, hard-working man who wants to deliver the very best results I can for the Territory and for Territorians". After speaking for three minutes, Mr Westra van Holte took three questions before he called an end to the press conference and walked out. Mr Elferink remained silent throughout. Mr Westra van Holte is the third CLP chief minister since the party came to power in the Northern Territory in August 2012. There had been concern within the CLP parliamentary wing about Mr Giles's leadership style and judgment, his handling of the scandal surrounding former police commissioner John McRoberts, his championing of the sale of the Territory Insurance Office and his ability to communicate the government's strategy to the public. Earlier on the same day as he was toppled as leader, Mr Giles told the ABC he was not worried about a serious challenge and described rumours he was to be replaced as evidence of the healthy competitive nature of his party. "I think it's good that everyone in Parliament wants to be the chief minister and wants to be able to put forward their vision, their view about how to take the territory forward into the future," he said. On the day of Mr Westra van Holte's trumping of Mr Giles, then-deputy chief minister Mr Chandler said: "Look, we have a Chief Minister, we only need one Chief Minister. We have one, we don't need another one." I think it's good that everyone in Parliament wants to be the chief minister and wants to be able to put forward their vision, their view about how to take the territory forward into the future. Adam Giles, speaking about internal party rumblings, only hours before before being dumped as NT chief minister. At a Darwin school to speak to students about leadership, Mr Chandler said Mr Giles "absolutely" had his full support. Speaking on the afternoon in the lead-up to the coup, Corrections Minister Robyn Lambley said the weekend's devastating Queensland election result for the Liberal National Party had not gone unnoticed. "Adam Giles has my support, but it is a time of reflection. I think what we've all taken away from the Queensland election is that nothing can be taken for granted and perception is everything," Ms Lambley said. Mr Giles, 41, secured the NT's top job in March 2013 from Terry Mills, who was in Japan on a trade mission and learnt by telephone he had been rolled by Mr Giles and close Giles ally, Dave Tollner. Afterwards, Mr Giles rebuffed media descriptions of the episode as a coup. Mr Giles, who had stood for election in the ACT in 2004, became the Australia's first Indigenous head of government. Mr Mills, who led the CLP back into office in August 2012 after 11 years in opposition, resigned from politics in February 2014 to take a job in Indonesia as a trade envoy. 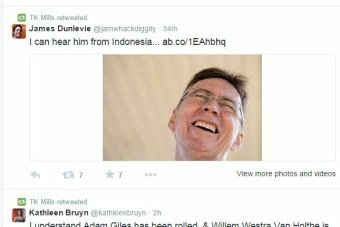 Soon after the news broke of Mr Giles being dumped on Monday, Mr Mills retweeted the news and a photo of him laughing. Less than an hour after Monday's coup, Mr Giles's Wikipedia page had ben amended and Mr Westra van Holte had been installed as the new leader. The tumultuous events round off Mr Giles's reign over a troubled CLP, which has been split by personal rifts and controversies since it won government three years ago.